A simply stunning community near Fort Lauderdale, FL. Your choice for Independent living in South Florida. Covenant Village of Florida is the perfect place to fulfill your hopes for retirement and satisfy your dreams of Independent Living. Here in our suburban Plantation, FL, community—only minutes from Fort Lauderdale—is the ideal vantage point for you to pursue your interests. If you’re looking for a community with the extra perks of sun and fun, Covenant Village of Florida offers an inspiring lifestyle. Take a trip to a nearby beach or dig your toes into the white sands of Boca Raton. Go shopping at the mall just down the street. Take a dip in our outdoor pool surrounded by palm trees, work out in the lap pool and bask in the Jacuzzi. 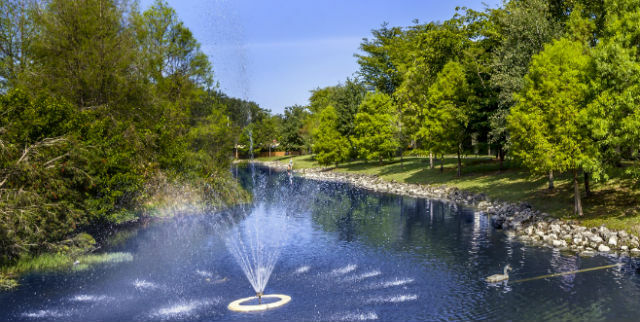 Enjoy our beautifully landscaped 20-acre campus or stroll through Plantation Central Park, just outside your back door—offering walking paths, tennis courts, billiards and more. Our Town Center, with its stunning atrium, is a lively gathering space where you can chat with friends, connect to a Wi-Fi hotspot, Skype your family or borrow a book. We’ve even added an off-leash dog park where you can let your pet run free. Best of all, you won’t have to leave our close-knit campus to enjoy delicious dining and a wealth of amenities, activities and conveniences each day, right where you live! Our LifeConnect® approach to total well-being means we care for every aspect of who you are and what makes you truly thrive. Our Photo Gallery and Floor Plans will give you a taste of the fulfilling Independent Living that can be yours when you make your home at Covenant Village of Florida. But, to truly experience the unlimited potential of your ideal, worry-free and maintenance-free retirement as part of our exceptional community, we invite you to schedule a visit and see for yourself!